THE HAGUE, WILLEMSTAD - The convictions of the former Prime Minister of Curaçao Schotte and his partner for official corruption and money laundering remain in place. This is according to the ruling of the Supreme Court in The Hague today. The imposed sentences are also definitive. 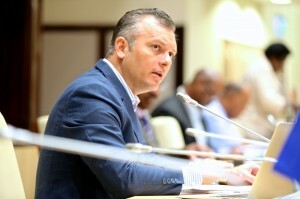 According to the Supreme Court, Schotte was a politician in Curaçao at the time of the proven criminal offenses. He founded the political party Movementu Futuro Korsou (MFK). With effect from 10 October 2010, Schotte was the first Prime Minister of Curaçao. He held this position until the end of September 2012. The co-defendant is his partner. In the criminal case against Schotte, official corruption is central. Among other things, the court found that he had accepted donations, consisting of high sums of money, from a befriended Italian businessman who were meant to persuade him for special favors in return. In order to mask the origin of those amounts, he has made fake invoices. In the court's view, the defendant and his co-defendant have also committed money laundering and having the so-called 'frequency jammers', which are designed to cause disruptions in telecommunication. Schotte was sentenced to a prison term of three years. As an additional punishment, he was deprived of the right to be elected in elections for a period of five years. His partner received a prison sentence of fifteen months, six months of which were conditional for money laundering. Both suspects filed an appeal in cassation. In the judgment, the Supreme Court examines, among other things, the cassation complaints that are directed against the evidence used by the court for the official bribery. Schotte states that in his view there had not been any donations to bribe him, but that there had only been financing for his party MFK. The court ruled that the monetary amounts also had value for the suspect if they were used in full or in part for the financing of that party. Also in that case there are gifts. These donations were made to get Schotte's preferential treatment in his political positions. The Supreme Court does not consider this judgment of the court to be incorrect and is sufficiently motivated. Also the other cassation means in the cases of Schotte and his partner do not lead to the annulment of the rulings. Both convictions are hereby definitive.